A few cowboys try to woo a some local Oklahoma ladies, all of whom have other prospects. Running cattle and farming land is hard work. 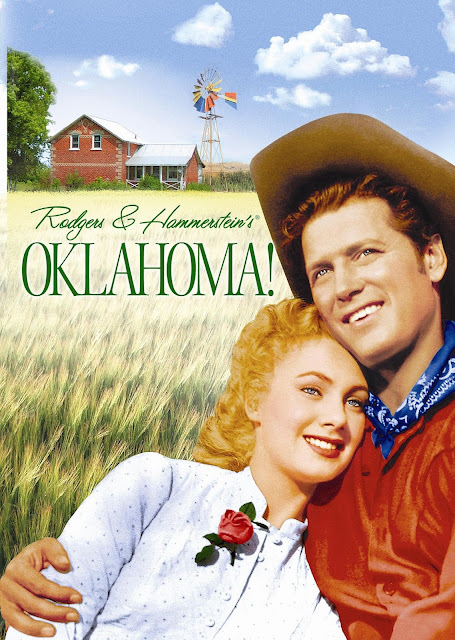 If you watch the cowboys and farmers in "Oklahoma!," you might think their lives revolve around romancing women with an occasional song and choreographed dance number thrown in for good measure. "Oklahoma!" is directed by Fred Zinnemann, who directed other films like "High Noon," "From Here to Eternity," and "A Man for All Seasons." It is written by Sonya Levien and William Ludwig and is based on the Rodgers and Hammerstein stage musical of the same name. It stars Gordon MacRae as cowboy Curly McLain, who has his eye on a farm girl named Laurey Williams (Shirley Jones). Laurey likes Curly as well, but she doesn't let on and plays hard to get. Laurey's farmhand Jud Fry (Rod Steiger) also has feelings for her, and this creates a bit of conflict because Jud is a person willing to act out violently in such cases. This is not the only love triangle in the story. Another cowboy named Will Parker (Gene Nelson) wants to marry another local farm girl named Ado Annie Carnes (Gloria Grahame) even though she doesn't have very strong monogamous tendencies. Ado Annie is courting a peddler named Ali Hakim (Eddie Albert) who clearly wants a fling and not a commitment...unless his hand was to be forced into such a thing. Old school musicals are so grandiose in their presentation. This is not a complaint, we totally dig it. Musicals are very focused on keeping a stage play type of spectacle, but with more detailed sets and a less intimate scope. There is a certain part of the movie-going public that will write musicals off entirely because they feel 'too unrealistic.' Well, they're not always supposed to be realistic. If anything they are meant to be a little more surreal. We will say there is one massively surreal dance number here brought on by Laurey's fever dream while she's high on smelling salts. We honestly could have done without this scene because it drags on for far too long. That being said, the rest of the movie is mostly pretty fun and is relatively engaging despite its old-fashioned sentiments and subject matter. Of course, the most important part of a musical is the music. "Oklahoma!" has some really great songs. With numbers like "Oh What a Beautiful Morning," "The Surrey with a Fringe on Top," "Kansas City," and the titular "Oklahoma," this picture is full of great music that will stay stuck in your head for days and will keep your toes tapping. Apart from the tunes, "Oklahoma!" has a solid cast and features a lot of excellent voices. The notable exception is Gloria Grahame, who can't exactly hold a tune but finds a way to make it work. The people behind the scenes had to Frankenstein her songs together from tons of recordings, but it doesn't matter because the end result is still decent. "Oklahoma!" is a good time and provided us with an entertaining viewing experience despite being a little dated.